The state government and the Ministry of Construction want to uproot illegally in Hambacher Forest again. Under the pretext of structural defects, activists are to be evicted from the trees. Last time they have massively cut trees , built highways and parking lots and thus damaged the valuable ecosystem of the Hambach Forest. They tried to break our resistance, but we are still there! Originally published by Aktion Unterholz Facebook page. 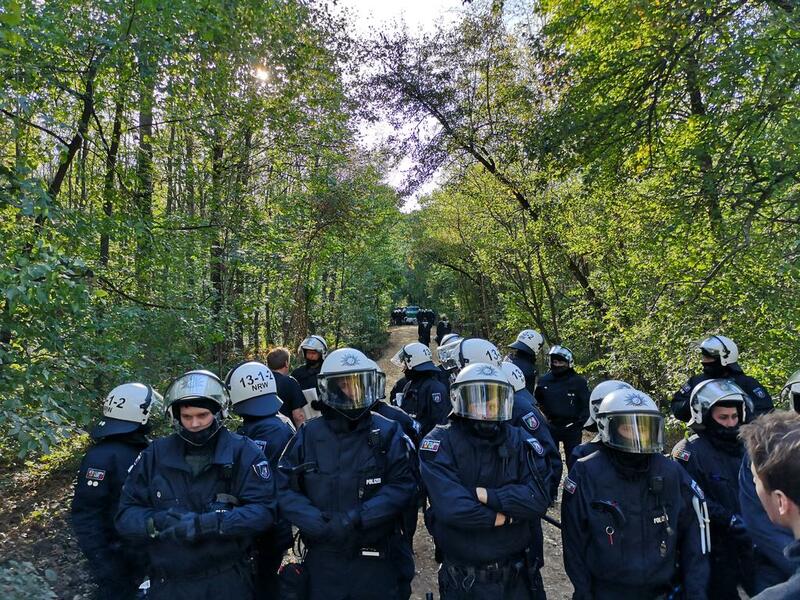 Image above: Archive image of evictions in Hambacher Forest in September 2018.
if you can, go into the forest this week to prevent evictions and clearing. At the camp and in the trees you are most welcome. take part in the activities. If you can’t during the week, be ready to be there at the weekend. express your anger, be it at work, in the university/school or on the internet, everyone should know: We want to end coal now, no more cutting of trees! We will announce in the next days when and what exactly will take place! Aktion Unterholz, January 7, 2019. #HambiBleibt: Let the forest stay! Forest walk in #HambacherForest on January 13 – Enough is Enough!